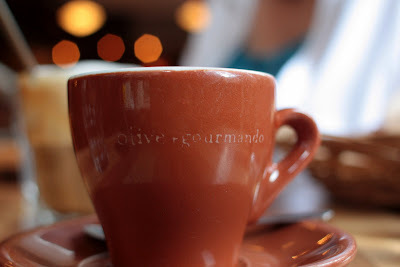 Blogging has provided me with the opportunity to connect with hundreds of wonderful people and there are so many of you who I would love to get to know better over a cup of coffee! 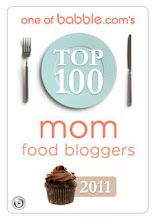 I'll just have to get to one of those blogging conferences one of these years! Anyway, I recently had the chance to meet a fellow Canadian food blogger who was in Montreal on business: Sue Robbins, or as she is better known, Foodie Suz. I picked her up at her hotel and whisked her around town to some of my favorite food spots. Sue was courageous to meet up with me, a total stranger, and while she expected a foodie tour, she didn't know that she was signing on for a white-knuckled drive. I can be, ahem, a rather aggressive driver, not to mention sometimes scatterbrained. Poor Sue! 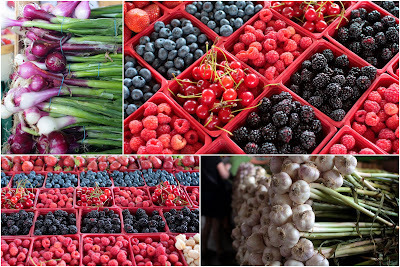 Artfully arranged produce at Jean-Talon Market, our biggest open air market. This stop also included a walk through the one-and-only Hamel cheese shop and a lengthy visit to Olives et Epices, which we later exited laden with exotic spices. 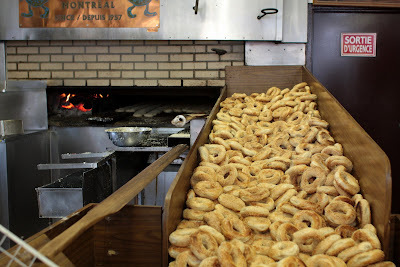 Of course we were working up an appetite so a stop at St-Viateur Bagels was not optional - it was mandatory! I love how this place never closes and the river of bagels is always flowing. We later popped in to my favorite cupcake shop, Cocoa Locale, but much to my dismay, it was closed, so no Chocolate-Chai Cupcakes for us. 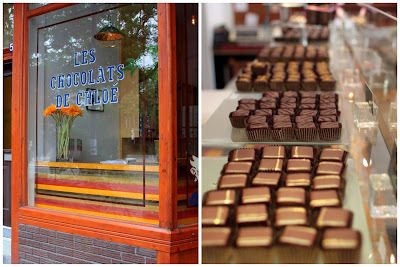 We still needed a chocolate fix, so instead we parked in my old neighbourhood, the Plateau, and walked to Les Chocolats de Chloé. A stunning little artisanal chocolate shop, I died and went to heaven with Chloe's Illy Espresso chocolate. 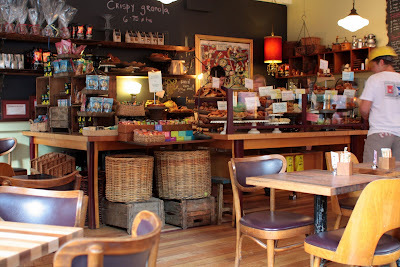 I would happily accept treats from this one-of-a-kind shop for any occasion--as long as I live! After drooling over upscale kitchen items at Arthur Quentin, we were in need of something a bit more substantial than chocolate. As Sue had already experienced the famous Schwartz's Deli on a previous visit, I decided L'Express would be a good option for lunch. The Parisian-like place was in fine form, including a grumpy Maître d', who huffily told me to remove my water bottle from the table. Or what? You won't serve me? Man, my days of snobby restaurant life are over. Lighten up! 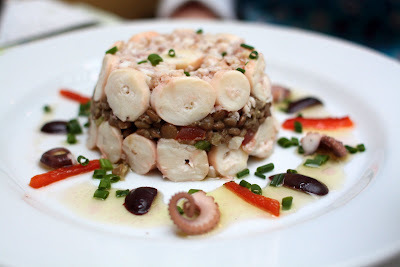 I think Sue enjoyed her octopus and lentil salad and I was relieved when she also ordered a side of fries, or else my lunch would have looked mightily unhealthy in comparison. 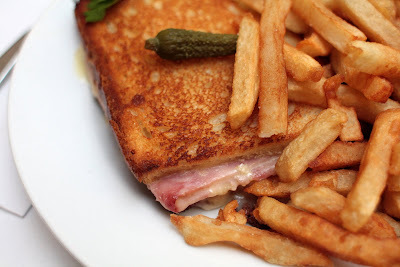 I feasted on what just may be the best sandwich in town, the Croque Monsieur from L'Express. Heaven. Think grilled ham and cheese, but such ham! and such cheese! Cooked to perfection and served with an immense jar of pickles maison (pictured above with Foodie Suz), this is the sandwich of my dreams. 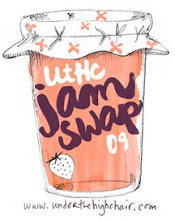 I so enjoyed my time with Sue and we were never lacking for conversation. We swapped book titles, recipes and favorite blogs, yakked about our kids and compared travel stories. It was wonderful to meet her. Thanks for looking me up, Sue, and for putting up with my driving! PS: Here is Sue's rundown of our day, including a photo of yours truly on what was a very windy day where the wind was sculpting my hair into something unnatural! Some great places to add to my list for our next trip to Montreal. You can be my foodie guide any day! 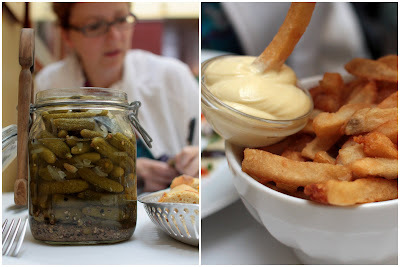 Thanks for posting this epicurean tour of Montréal. I often forget Montréal is only 2 hours from where I live. We never go and we should! I wanna meet a "foodie"! Looks like you guys had a blast and loaded up on tons of good food. What a lovely way to spend a Saturday morning sans enfants. It's all I could wish for in a visit to Mt'l, but I'm not sure about leaving Danny with five! Oh wow - I am drooling!! What a wonderful experience for the two of you. As always, love the pics. Thanks for the tour. Wow, I missed out on a lot of great Montreal cuisine! And of course a visit with you. However, I am in love with the city and vow to return soon. Aimee - what a fabulous recount! Your photos are just lovely. Also, just returned from Ireland - visited the famous Cork English Market and Montreal's Jean-Talon Market trumps that too! 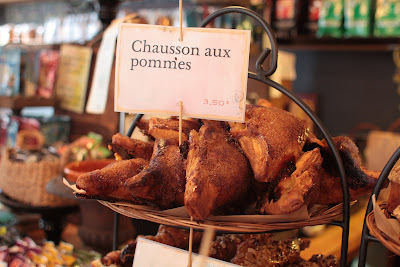 I think Montreal is a true world class food city. And thanks to you, a world class foodie, for touring me about! 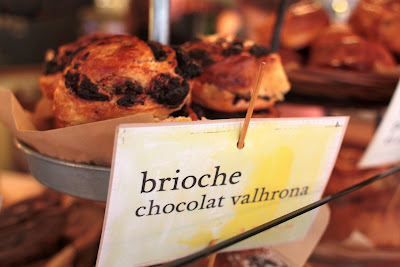 Seriously, you should think about putting on freelance foodie tours...you have a real gift there. Hi Lydia- I would LOVE to show you around. You are not so far away, you know. HI J- Glad you enjoyed it. We're lucky our city has so much to offer. Hi Ingrid- Good food indeed!Thanks for stopping by. Hi Haidi- Oh he could handle it! We'd bring back treats. Hi Katri- Ohhh, enjoy your visit! Hi Kickpleat- I hope you look me up when you come back! Hi Sue- You've got an idea there...Hmm.